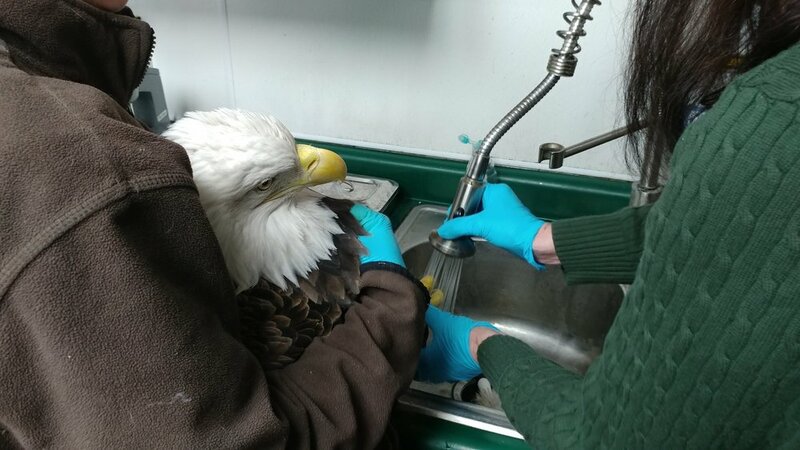 Adult Eagle Admitted With Lead Poisoning — Raptor Education Group, Inc.
UPDATE-- The blood lead was extremely high in this eagle, the highest we have ever seen. The metal just in the few drops of blood we use was so high it itself set up a "current" and interfered with our analyzer. Amazing!! We are using high doses of chelation. (CA EDTA) So far so good. Keep her in your thoughts. A beautiful adult eagle was admitted Sunday through Menominee Tribal Conservation. She was suffering from acute lead poisoning. The good news is the hunter that first observed the eagle was aware of lead poisoning in bald eagles. The eagle had flown in from another area and was at a gut pile when the hunter Jerrit O'Kimosh, who was hunting with his daughters and uses non-lead ammunition, when he witnessed the eagle’s sudden odd behavior. 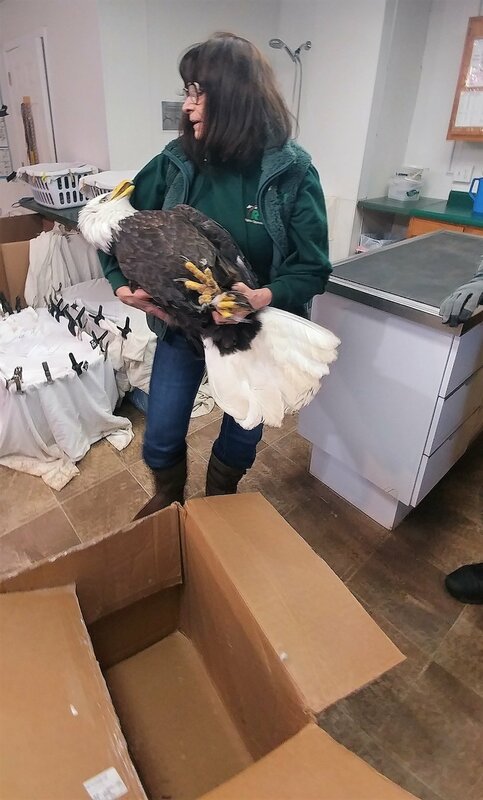 He immediately contacted Menominee Tribal Warden, Jaimie Guzman who in turn responded quickly to the call, rescued the eagle and picked up the gut pile to discard it safely and brought the eagle to Raptor Education Group, Inc. for care. I emphasize the fast actions of everyone involved, because that is what saved her life. The Menominee Indian Tribe has been a leader in our state and much of the country in educating the public on the dangers of lead poisoning in harvested game both for their own families and for wildlife including Bald Eagles. I could not be prouder to work with this amazing forward-thinking tribe where doing the right thing for the environment and wildlife is the prime concern rather than the politics and paltry excuses that seems to be on the mind of much of our country. When the eagle arrived at REGI she was in respiratory distress and suffering from strong seizures due to lead toxicity. We often must hold eagles with seizures in our arms, to prevent them from failing and breaking their own wings. That was the case with this beautiful eagle. Fortunately, she had vomited and emptied her crop while still in the field and lessened her exposure. We were able to draw blood on the eagle and start treatment within minutes of her admission. Lead causes multi organ shutdown and neurological damage. Our eagle patient is standing now and was able to eat some earlier today. She is receiving 2 injections a day of CA EDTA and will likely need several rounds of treatment before the lead is chelated from her body. She is not “out of the woods “yet by any means, but we are and will continue to do our best to get her back home. When and if she is released, the O’Kimosh family will have the honor. Acute lead poisoning happens when a healthy bird ingests a great deal of lead fragments in one meal. That is what happened with this eagle. She is a huge bird in good weight. She is perfect in everyway except she was suffering from seizures caused by the toxin. Eagles are known for their fishing ability, but they are also scavengers. In the late fall and winter months as our lakes are freeze over, the eagles turn to a readier source of food from discarded carcasses, or gut piles left in the woods by hunters. Hunting seasons in various forms which starts in Oct with youth hunt, traditional gun deer hunting in November and other seasons including black power season which is currently about to begin. The result is we have several months where carcasses are exposed and available for eagles and other wild animals to eat. If carcasses, are filled with lead fragments, as happens when the soft metal lead ammunition is used, eagles and other animals are poisoned by ingesting the lead tainted meat. Without treatment to chelate the lead from their blood stream, they die an agonizing death. Using copper ammunition is an easy fix, but strong lobbies have promoted faulty information to their supporters, taking advantage of the camaraderie hunters feel for one another, to promote the use of lead ammunition. To what end is anyone’s guess, but it is not gun rights, or to protect hunters or hunting, or families that eat harvested game or wildlife that we have a share responsibility to protect as best we can. We care for about 100 Bald eagles a year at REGI. One quarter of them have lead poisoning. Most eagles or other species with lead poisoning are never found and die without help in our remote part of the country. We are grateful to the Menominee Indian Tribe of Wisconsin for their leadership in conservation including opening the conversation about switching to copper ammunition for harvesting game. Doing the right thing is not always easy. Understanding that wildlife doesn’t vote and counts on us to make solid decisions in matters that affect them, is important and makes their contribution all the greater. Showing neurological signs from lead poisoning. The eagle had a strong seizure as we were examining her which was so powerful it tossed her into the air. Menominee Conservation Warden Jaimie Guzman rescued and transported the critically ill eagle. 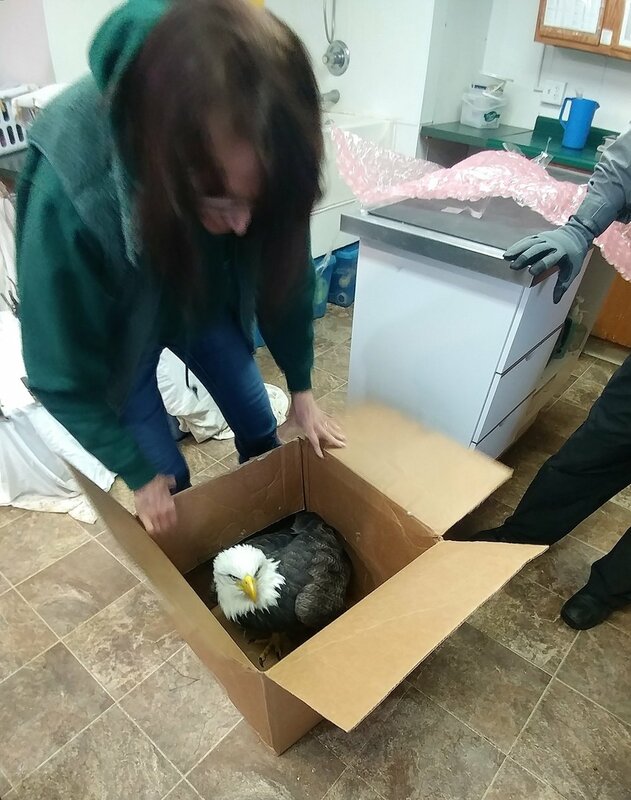 The eagle was having seizures when taken from the transport box. The family that found the eagle uses Copper Bullets and was saddened to find the eagle suffering lead poisoning.